← Wkly Brief – Should We or I Lead? 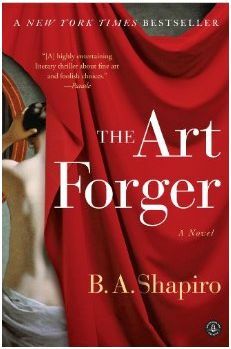 The two books tackled this month will be The Art Forger by B.A. Shapiro, and my Twitter Authors selection is After by Kristin Waterfield Duisberg. I don’t wait for his answer, because I know he’s not listening; and no, he doesn’t know the rock by the river next to the tree in the Jackson’s yard, because you see, he doesn’t live in my brain. Listening or not, I ramble on about ghosts and maidens and haunted rocks. I’ve been told that writers…no wait, not writers, but rather, their significant others…can relate to this meandering read-and-call-out research method. But because I allowed myself to become immersed in the first books selected, all of the remaining research books sit alone and neglected. The good news? With all of this non-research happening, I found time to read four books last month, which I now share with you. Black Ice by Lorene Cary, (paperback). This memoir of “an ambitious black teenager from Philadelphia” transplanted to New Hampshire, portrays a young woman balancing on the edge of discrimination and acceptance. The prose, as vivid as a painting, would cause me to pause to reread passages, seeking the magic behind the words. While there were more gems toward the beginning of the book, the narrative held my attention until the last page. Inferno by Dan Brown (audible). As we travel with Robert Langdon from Florence to Venice, literary and artistic masterpieces are unveiled to deliver a morbidly fascinating story. Brown weaves together a story with layers of change that kept me interested and guessing from beginning to end. The Plague of Doves by Louise Erdrich (hardcover/audible). This series of short stories are interwoven into an intriguing, although confusing, novel. By the end I considered revisiting scenes to figure out what really had happening, but instead decided to read something new. The Weird Sisters by Eleanor Brown (hard cover). See my May Review, completed with assistance from Shakespearean expert Elizabeth Rentfro, my go-to person for all things Shakespeare. Ms. Rentfro has an MFA from Mary Baldwin College and is currently appearing in Rosencrantz and Guildenstern are Dead with the Promethean Theatre Ensemble at the Athenaeum Theatre in Chicago, IL. Have you read an Indie Author’s book this month? If not, please do! You can find titles on my Twitter Authors page. P.S. A shout-out to my excellent waiter at TGI Friday, Ian, who kept the coffee and good food coming while giving me time to write this blog! This entry was posted in Book Reviews, FYI for Regular Visitors, Reading and Writing and tagged Book Review, Dan Brown, Kristin Waterfield Duisberg., Reading, Twitter Authors. Bookmark the permalink. My family tend to ignore me when I do research too 😀 I get so engrossed I babble on about stuff that is really out of the blue! Thanks for the comment. I think the research and stumbling upon tidbits makes being being a writer/researcher interesting.